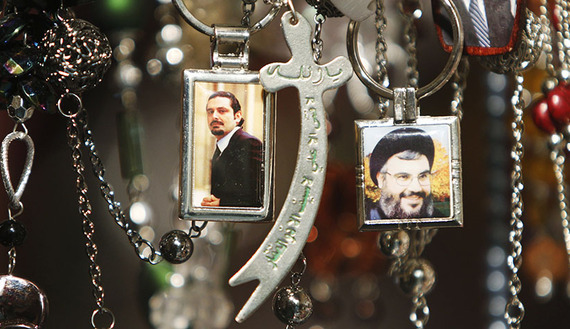 March 8 officials praised former Prime Minister Saad Hariri’s support for a dialogue with Hezbollah Friday, with the hope that the talks between the two rival parties would help defuse the Sunni-Shiite tensions. In an interview with LBCI TV at his Paris residence Thursday night, Hariri said he was serious about a dialogue between his Future Movement and Hezbollah, adding that the talks with the militant Shiite party were designed to defuse Sunni-Shiite tensions and shield the country against security threats linked to the war in Syria. Thousands of Hezbollah fighters are helping the Syrian regime against the mostly Sunni rebels who are trying to topple the regime. Hezbollah’s role in Syria has come under attack because it brought the Syrian civil war closer to home. “The atmosphere is positive and matters are heading toward dialogue between Hezbollah and the Future Movement very soon,” Hezbollah MP Ali Fayyad was quoted as saying by The Daily Star newspaper . MP Ali Khreis from Speaker Nabih Berri’s parliamentary bloc echoed a similar view. “Definitely, Hariri’s statement paves the way for starting the Hezbollah-Future dialogue, which is basically aimed at defusing political and sectarian tensions in the country,” Khreis was quoted as saying by The Daily Star. “Hariri’s statement contained several positive elements when he said that he is serious about a dialogue with Hezbollah and that he does not set preconditions for this dialogue,”Khreis added . Similarly another MP from March 8 alliance sounded optimistic about Hariri’s stance. The former premier also met with former President Michel Suleiman in Paris on Friday, and they reviewed developments in Lebanon and the region. The meeting was attended by Nader Hariri, Hariri’s chief of staff. Meanwhile, the Constitutional Council, unanimously rejected a challenge filed by Aoun’s bloc against the extension of Parliament’s mandate by more than two years, saying its decision was designed to prevent further vacuums in state institutions. “The Constitutional Council unanimously rejected the challenge in order to prevent further vacuums in constitutional institutions,” the council said in a statement at the end of its meeting. The council’s decision came amid calls by Aoun’s bloc, civil organizations and NGOs to annul the extension and hold parliamentary elections. It also comes at a time when there is a presidential vacuum, as Parliament has failed since April to elect a successor to Suleiman. Lawmakers from the rival political coalitions – March 8 and March 14 – as well as independent MPs voted earlier this month to extend Parliament’s mandate for two years and seven months by a 95-2 margin. The move prompted Aoun’s bloc, whose MPs had boycotted the vote, to file a challenge against the extension with the 10-member Constitutional Council. It also said that linking the elections to a new electoral law violated the Constitution. The council called for immediate parliamentary elections once the extraordinary circumstances that prevented the elections from taking place ceased to exist. “Elections should be held immediately … without having to wait until the extension has expired,” the statement said. The Lebanese Forces, which voted for the extension of Parliament’s term, praised the council’s decision. “The importance of this [Constitutional Council] decision is that it has stressed that vacuums in institutions should not be allowed,”Lebanese Forces MP George Adwan told reporters after meeting Speaker Berri at Ain al-Tineh. Adwan a key member of the M14 alliance also praised the planned dialogue between Hezbollah and the Future Movement . M8 has proven time and time again it will not compromise. The Future Movement is wasting its time. Nice of that he forgave them for killing his dad… that’s so very christian of him. He forgave bashar already so why not hassan? Forgiving doesn’t mean forgetting. He knows he needs to keep that eye in the back of his head. Compromise doesn’t need to be total dissemble … although Hezzy’s want that as surely as El Supremo … but ol’ Nasty may agree to some temporary ‘giving in’, just to take the heat off his own image. Watch it change quickly later …. IF this 25-yr war ends. Or … if it becomes 100 years as Europe experienced. Ideologies at work. All they’re talking about is “easing tensions”? What’s the benefit of such “dialogue”? And where’s the wisdom in dialoguing with someone who has not respected the results of past dialogues? There is one way of talking to nasrallah and it’s through a defense lawyer. Name that “party” a terrorist organization, which it is, and put an end to what we all know is a monologue under the threat of an Iranian gun. And ASSad&Co. made sure it continued that way …. while the ‘Religionists’ love their little fiefs. It’s as Tribal as Iraq. On the weekend, ‘the people’ joined hands along the coast to promote the solidarity. I don’t think the ‘Masters’ enjoyed it. More talk and still no action, don’t hold your breath guys someone will object to something some where. Including the promised house-rebuilds in Tripoli? How Syiah distorted Islam religion..I tell you how Syiah ulema cheating all Syiits…When the prophet muhammad said..when you see black flag from Khurasan..join them..( this Khurasan black flag will join previous struggle in middle east (previous black flag)in other Hadis the prophet said AlMahdi will appear in Iraq,people will acknowledge him in a mosque,in Iraq…otherwise Syiah ulemas said.. to prolong their political gains and to defeat muslims..They said Ali had said..when you see black flag..don,t move your hand and feet..(not to join them)..That is what Syiah ulemas have done.So Syiah ulema know the prophecy and they try to prevent muslims to win over Jews Zionist by prevent muslims to join that black flag ..I do believe it is also Jews influence on Syiah religion,Syiah-Abdullah Ibnu saba teaching..one of syiah teacher,is a Jew..Syiah is not only a political religion,rebel faith at the past and bad cultures and bad moral that mixed badly on Syiah religion,it is also Jews, who corrupted Syiah believe..Wise ofJews also know the prophecy a bout black flag by The prophet muhammad pbuh.So they tell Syiah ulemas not to join black flag..in order to survive and prolong their weird Zionist movement and win over muslims..of course Syiah praises Ali better than the prophet..so they said Ali who said not to join black flag..and there are no such claim by Ali in sunni books.That is their way,the Syiah..love politic badly. Well Zabada … Mixing the religion with politics has always proven the worst way. And by this century, there is so much re-written by those ‘Hadiths’ that they will never get it straight. Sorry, i don’t understand how a secular Syria has distorted the..”ulema sheathing all Syiits..” Allawite are a branch of Shia. Christians, Armenians, Kurd, moderate Sunnis were the first travail of the “rebellion”..Kah Kah Kah.. Seems in a jolly mood, good keep it that way !!! It’s an ambiguous question.. lets try to be rational. Saddam Hussein was a secular dictator government.. When Iraq was invaded, Iraqi Christians who had lived uninterruptedly in Mesopotamia and Babylon since 2000 years, were massacred and fled to Syria, a secular dictator government, all sects lived together in peace (read about it) = for the first time Christians who had lived in Syria uninterruptedly for 2000 years were massacred and fled = the Iraqi Christians had to flee, again. Tthe West said nothing but sent aid to the Azeris and Kurds. Lebanon detains the wife of the Calif.. Which is why they attacked the army today … and disappeared another soldier to ‘bargain’ with.